The words put a definite responsibility on us, but they also acknowledge Christ's role when we take on that responsibility. We acknowledge that Jesus is our Savior. We acknowledge that we and the world we live in are broken, not what God desires, and that we can't fix ourselves or the world on our own. We need a Savior. And we have one in Jesus Christ. Those words speak of grace. God's grace is the gift of God that welcomes us and empowers us to welcome others even when it's difficult, when it requires us to change, and when we don't even know what we need to change or how. Those words also speak of trust. They challenge us to put our "full" trust in God's grace. They challenge us to build bridges of understanding and welcome across racial lines. They challenge us to see and learn how race affects church and society. And they challenge us to make changes that will bring our reality closer to God's vision, all the while trusting that God's vision is worth striving for and trusting that God's grace will enable us to do what we couldn't do on our own. I'm grateful and excited that Pastor Julie will help us explore race relations as she preaches this Sunday. I hope you will join her and me, the Access band, and the rest of the Access congregation as we all gather to affirm our faith and seek God's grace to help us grow into the people and church God would have us be. I married into the Methodist Church. My father's family was Episcopal and my mother's family was Baptist. While working in London, I attended Wesley's Chapel and visited his house and museum. I read his works and the heard Charles songs and read their writings about "Do all the good you can...."
Two months ago, I discovered a small book with my 4-great grandfather Samuel Woodson's named etched in gold on the leather cover. It was printed in 1846 by the Methodist Episcopal Church, South and was the collective writings of the Wesley's. Samuel carried the book with him in his migration from Virginia to Western Kentucky. Wow, Woody! 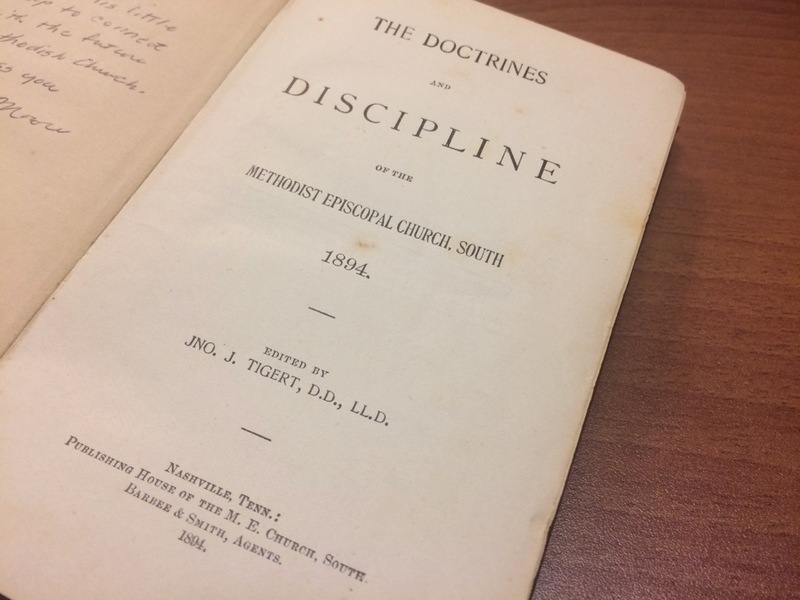 What neat experiences connecting you to our Methodist history!